When I was a kid, I was obsessed with Saint Cinnamon. My favourites were the almond or pecan-topped rolls, and I especially loved watching the rolls being made in store. Those huge slabs of dough! All that butter! All that sugar! Wow! I thought working at Saint Cinnamon would be the coolest job ever. The Saint Cinnamon chain seems to have closed down now, and I'd completely forgotten about my obsession... until Sandra sent me the link to Joy The Baker's Cream Cheese Cinnamon Rolls. The rolls are made from a buttery yeasted brioche dough, which is laminated with cream cheese. The dough is rolled out, then sprinkled with a mixture of brown sugar, raisins, chopped nuts and spices. This is rolled up into a log, sliced, then baked and drizzled with a buttermilk glaze. Wow! I had to have them, and I baked them the very next weekend for Sunday breakfast. (I omitted the raisins because no thanks). Ta-dah! They were absolutely incredible! Really buttery and tender, with a rich cinnamon flavour and a lovely crunch from the nuts and (all that) sugar. They were delicious fresh out of the oven, but were still good for the next couple of days. I think all that butter and cream cheese in the dough helps to keep them moist. I shared them with my family and some friends - big sugary thumbs up all around! Hot tip: they're more fun to eat if you unroll them and eat them in one big spiral. Let's take a look at the process. They take quite a lot of time to make, but the results are totally worth it! I thought it was a fun way to spend a weekend. Here's the dough, after the butter has all been kneaded in and before the first proving. Once the dough has risen for an hour, you can roll it out and add the cream cheese. Folding the dough over itself and rolling it out means you distribute thin layers of cream cheese throughout the dough. Delicious! (By the way, this process of folding and rolling is called lamination). This time, we're only doing one round of lamination. If you were making croissants or puff pastry, you'd be using butter instead of cream cheese and you'd probably do this three times. Can you see the thin streaks of cream cheese distributed throughout the dough? And here's where we indulge our childhood dreams of Saint Cinnamon-employment - brushing the dough with melted butter, and sprinkling it with the filling mixture. Fun! This picture below is from when I made the original recipe - you can see some chopped nuts in the filling. Ok, so if you roll up the dough as it is, and then slice the log into eight, you'll get eight large rolls out of the dough. If you're making little rolls like I did the second time, you just need to cut the dough in half crosswise, and roll the two dough pieces up into two thinner logs before slicing them into eight pieces each. Easy! 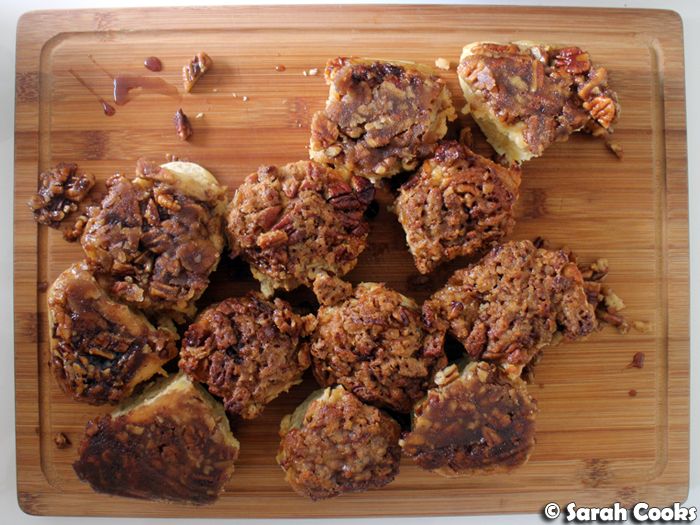 Okidoki, these next photos are from the time I made the pecan-topped rolls. 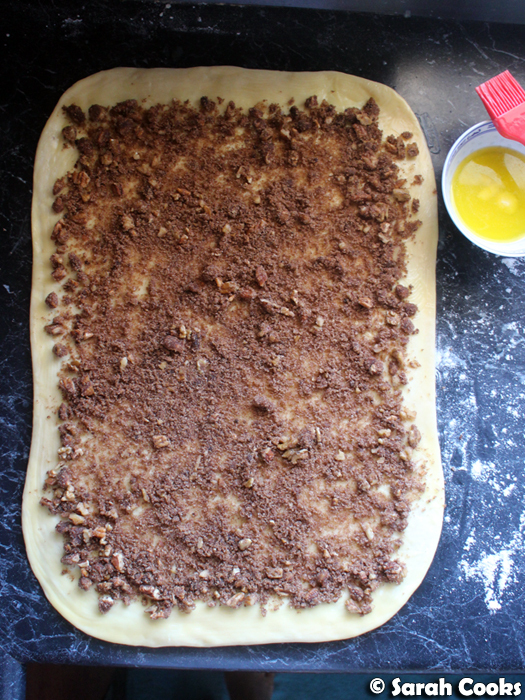 Here's the pecan-sugar-butter topping, spread out into the baking tray and waiting for the buns. 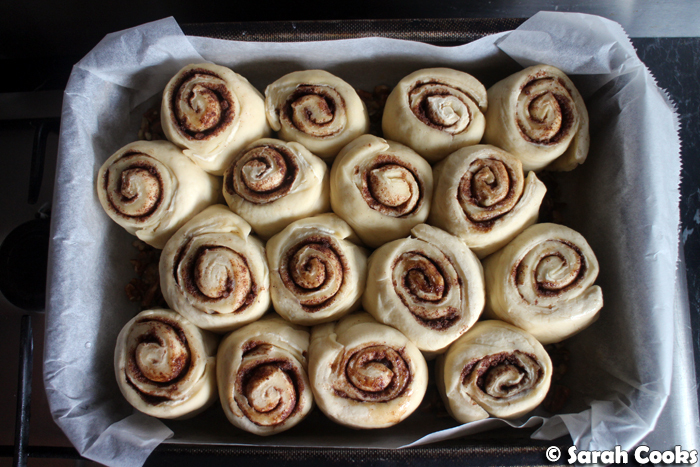 As you have seen, there's quite a lot of work involved in making these, but the good thing is you can do everything up to this point, and then leave the rolls to have a slow rise in the fridge overnight. 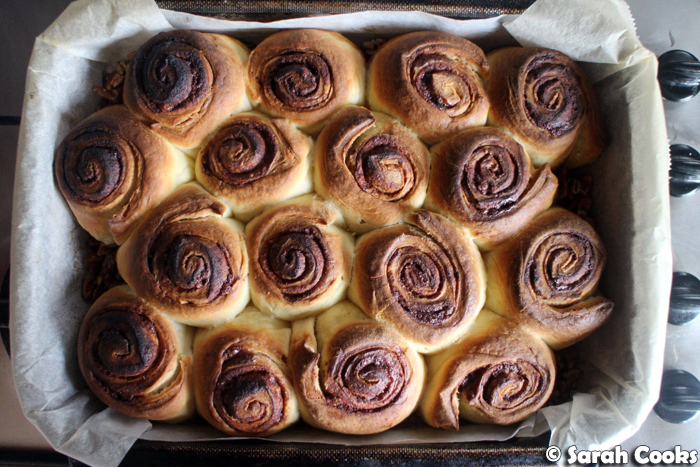 Then in the morning, all you have to do is chuck them in the oven, and half an hour later you have a tray of gorgeous sweet and crunchy cinnamon rolls. And your kitchen will smell amazing! It helps if you cut around the individual buns to help separate them before you turn them out. These are so good! 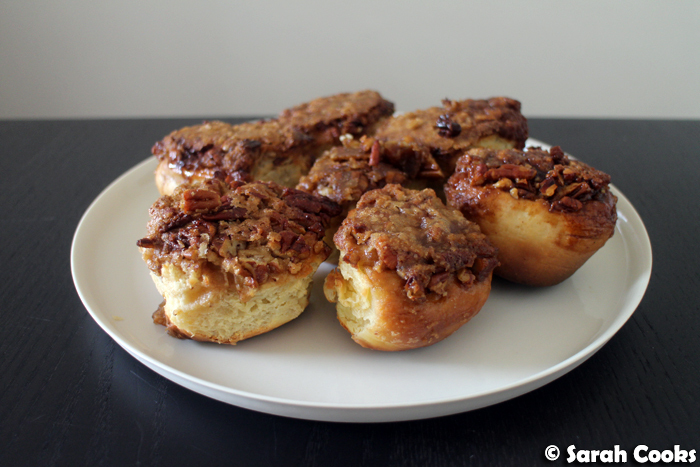 The pecans go all toasty and crunchy in the sugary topping, contrasting with the soft, pillowy dough. 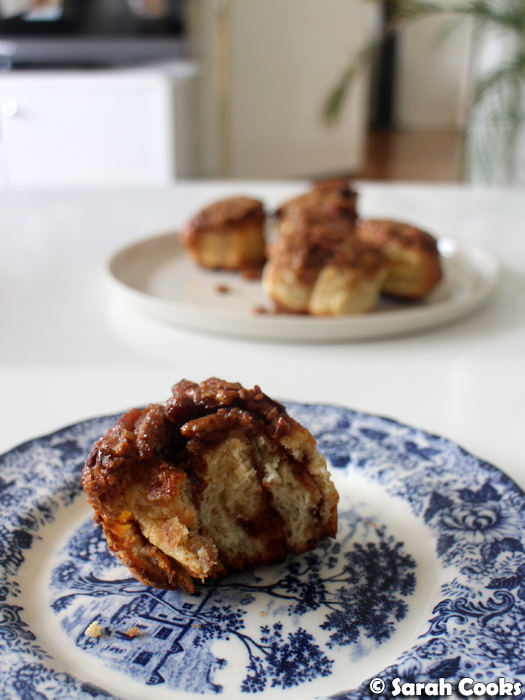 The cinnamon and cloves make it smell super comforting, and you can really taste the delicious butter throughout the rolls. Ridiculous! 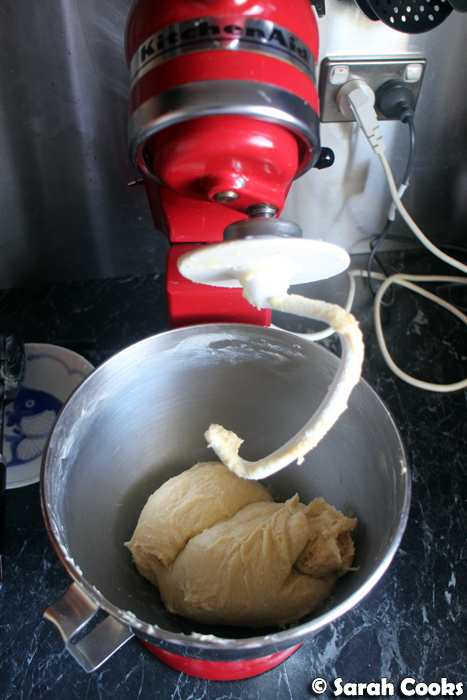 For the dough, place the yeast and 1/2 teaspoon caster sugar in the bowl of a stand mixer with 1/4 cup warm water. Allow to stand for 10 minutes until foamy. Add the 2 tablespoons caster sugar, milk, light brown sugar, vanilla extract, egg and egg yolk, and whisk to combine. Fit the bowl onto the mixer, then add the flour and salt. Knead with the dough hook (slowly at first!) until combined. Knead on medium-high for 4 minutes. With the mixer going, gradually add the softened butter. Once the butter is all added, continue to knead for 4 minutes. Add an extra 1/3 cup flour, and knead until combined. Form into a ball shape in the bowl, cover with cling wrap and leave in a warm place to rise until doubled in size, about an hour. Meanwhile, prepare the topping and filling. For the topping, heat the pecans in a dry frying pan until toasty and fragrant. Allow to cool, then tip onto a chopping board and roughly chop. Stir together the caster and light brown sugar, the maple syrup and the softened butter. Add in the pecans and stir to combine. Line a 20 x 30cm baking tray with baking paper. 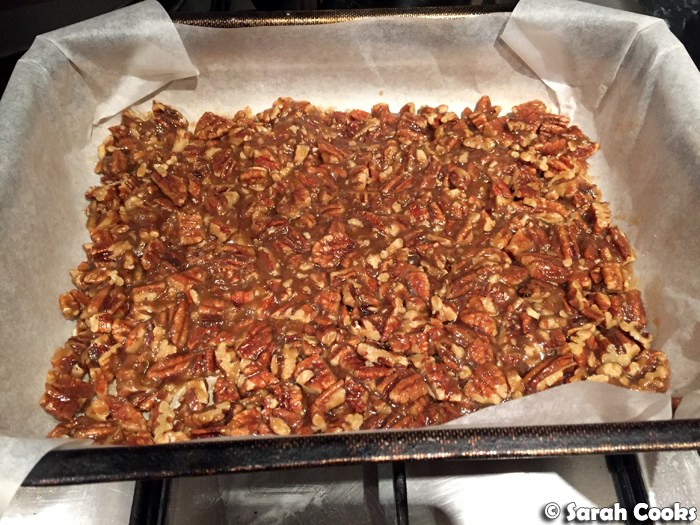 Tip the pecan mixture into the baking tray and spread out as evenly as you can manage. Set aside. For the filling, stir together the caster sugar, dark brown sugar, cinnamon, salt, cloves and maple syrup. Set aside. Time to assemble! Once the dough is doubled in size, punch the dough down to expel the gas. (Heh). 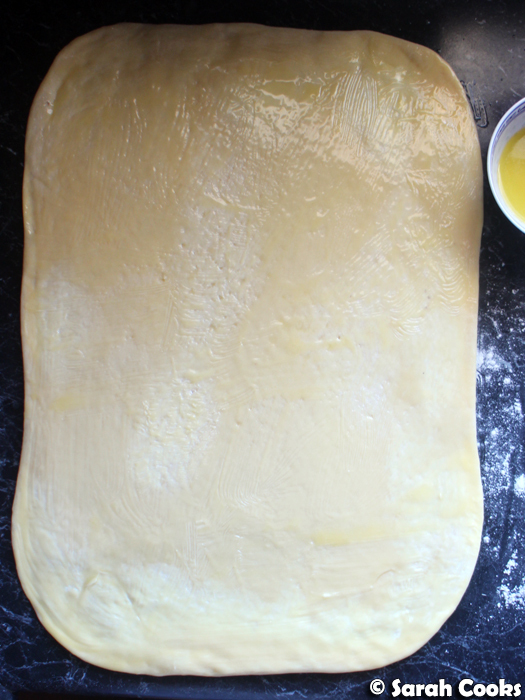 Tip the dough onto a well floured work surface and knead lightly until smooth. Roll out into a 25 cm square. Chop the cream cheese as finely as you can manage (it will squish a bit, not a problem), and sprinkle evenly over the dough. Fold the square into thirds like a business letter. From the open ends, fold into thirds again to form a smaller square. 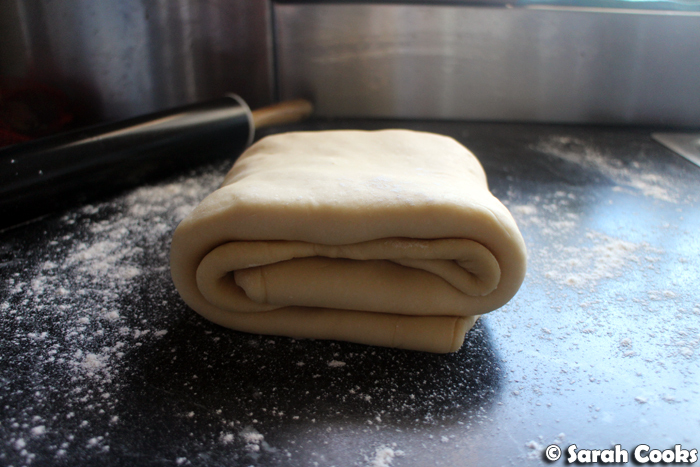 Place the dough seam side down, and gently roll out into a 25 x 50 cm rectangle. Cut the dough in half crossways, so that you have two 25 cm squares. Brush the dough squares with the 30 grams melted butter. 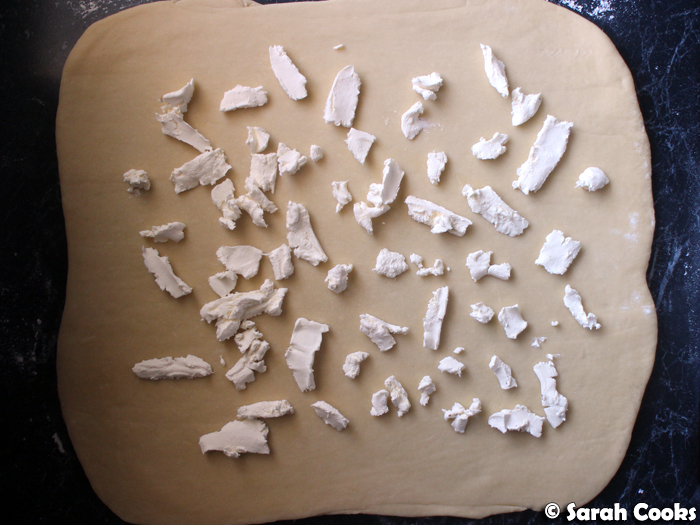 Sprinkle the dough squares with the filling, and roll up each square into a tight cylinder. Cut each cylinder into 8 even pieces (16 in total). 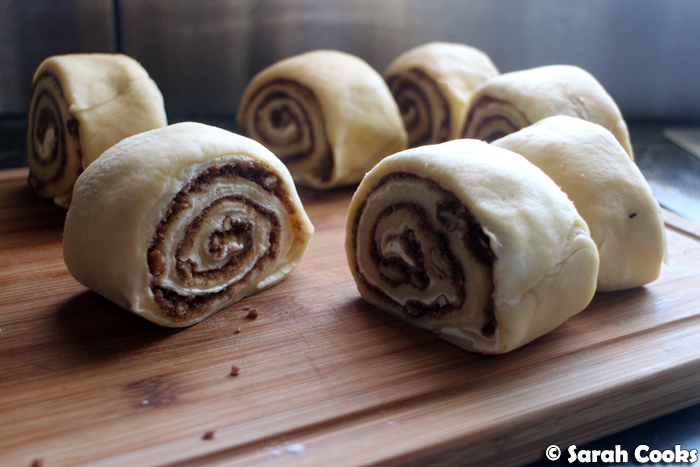 Place the pieces, swirl side up, in the pecan-lined baking tray. Cover the tray with clingfilm and refrigerate overnight to prove. To bake, preheat the oven to 190C. Take the rolls out of the fridge to come to room temperature while the oven is preheating. Remove the clingfilm. Bake the rolls for 30 minutes, or until cooked through when tested with a skewer. (Cover with foil if they get brown before cooking through). Remove the tray from the oven, and gently cut around the rolls to separate them. Allow to stand for 10 minutes, then invert onto a large serving board to serve. 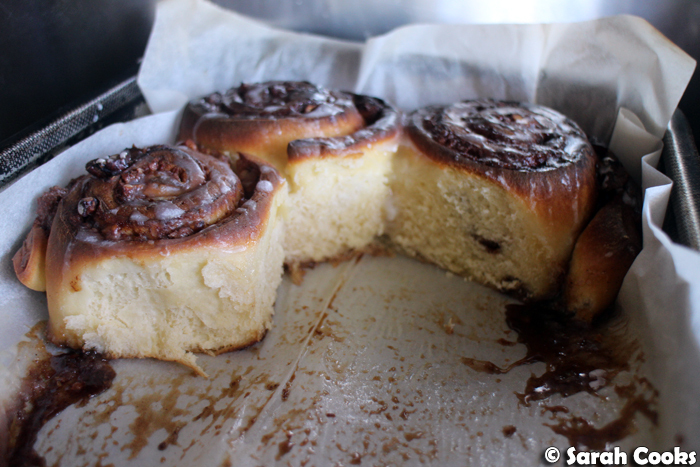 Makes 16 delicious sweet and crunchy cinnamon rolls. There was the briefest of moments when I thought there really was a Saint Cinnamon. roflmao! Wow! It looks so delicious and everything is so worth it. I love cream cheese and pecan! YUM!